You look very organized, with drawings too! At this time of year I like to think at my dining room table best. But my favourite thinking place is definitely the garden itself… I have also made a few sketches – no doubt they will also be changed! It is only February and my plum trees have buds on them. Too late for pruning now. Your garden plan looks great and what a fabulous view. I could do lots of thinking there! I think best when I am exercising or walking in the garden. Getting the blood flowing seems to make my mind start churning out ideas. What a posh plan! Mine is often a scribble which then gets misplaced. Me and my fellow allotment plot slogger had the brainwave of scanning it onto the computer so that we can always get it back from the ether if we lose the hard copy. My thinking place is: all over the place. (But most often when doing the gardener’s prowl around the borders). You are so stylish even your seed box is pretty not to mention the plan. My seeds live in two plastic tubs that once held chicken poo fertiliser and are still a bit whiffy. As for the plan at best it is a scribble on the back of an old seed packet but otherwise fights for space in the jumbly space between my ears underneath my red wooly hat. Ha ha! That space underneath your red woolly hat is the most creative place ever. Not only do you have to organise your garden and grow lovely produce but you also have to wrestle with the elements. I also like the fact your seeds are kept in a chicken poo tub… the mark of a proper gardener!! Thanks I was born without the pink gene, so I have a double helping of utilitarian pragmatism! Even the pjs are monochrome and not a ribbon in sight. I still need to sort out a proper thinking place! Anyway, I know what you mean about not being able to close the lid on the seed box – you have inspired me to go through mine. Some of my seeds must be well past their use by date. I had some very old seeds but have found that their germination rate isn’t very good so no longer waste my time. I’ve tried not to over buy this year and use what I already have. On the loo. It’s like a second office. There’s a phone, an ergonomic chair–plus it gets great wifi. Much thinking, but most ideas get flushed. In the meantime, I will live vicariously through your masterful organization, PJ. Look forward to seeing your garden grow. I like it! At least at means that you visit your thinking place on a regular basis! I have a special room upstairs painted a bright green that is my thinking place and then at my desk int he library and of course out in the garden. Still have snow on the ground and snow falling here. I like the thought of a bright green room to think in… I’d feel like I was curled up in a leaf! Brilliant! I really fancy your water colour garden plan, especially the way you painted the Year. So pretty, I’d frame it straight away. How ever did you get that all multicoloured? There won’t be any gardening here for a couple more months but I’m currently growing cat grass for Petals & Blossum in the kitchen window. I bought 3 small containers and all the seed they had (4 envelopes). I looked all winter with no luck, now finally, they’re at least putting out the seed packs. I don’t know if I have a thinking spot, but I did enjoy 1/2 of the kitty pillow a couple of nights ago, while I was lying on the floor of my craftroom looking at magazines. Blossum had the other half. It’s pretty cozy, I almost took a nap. LOL Your little munchkins are looking healthy. Love all those stripes! Cute as buttons xo. Do they go outside PJ? Will they spend time with you in the garden? That’s so kind of you to say Boomdee as I was just playing with watercolours. The 2013 is just different paint colours that have been allowed to run into one another. PS, thanks for the watercolour info, very pretty. Loved your water colour plan, do you normally stick to your plans? Is the change this time unusual? I keep changing my mind all the time about my garden, often because of some plants I have read about on someone’s blog! I often change my mind too Helene! I move things around and the plan will look very different in June. 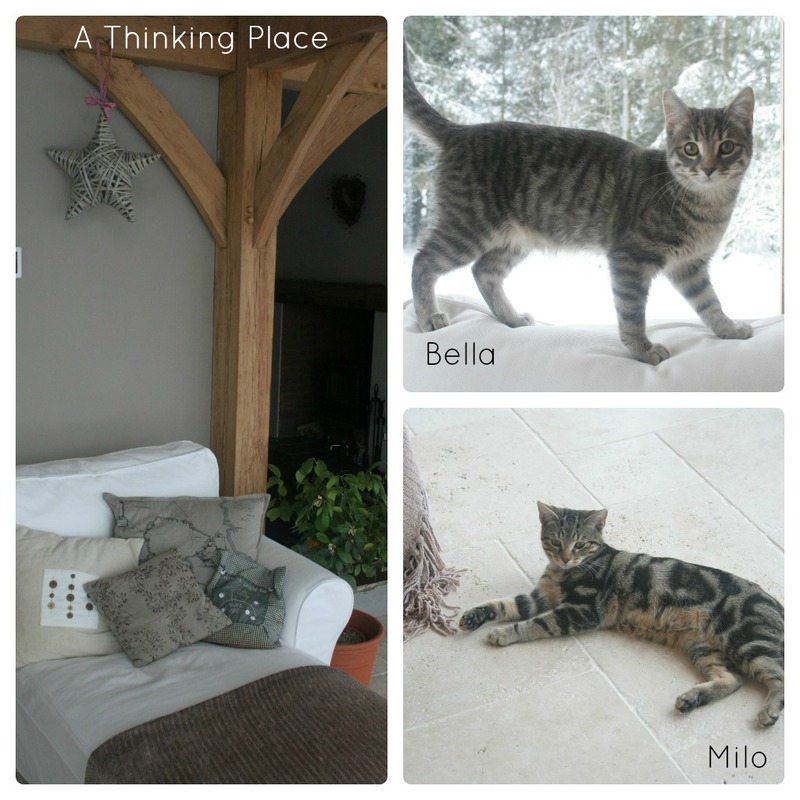 I like the idea of having a special place to think – yours looks most comfortable and relaxing. What a lovely view you have and an excellent place for thinking and contemplating. The plan is terrific but the fun comes when you try to follow it! Thanks for stopping by! 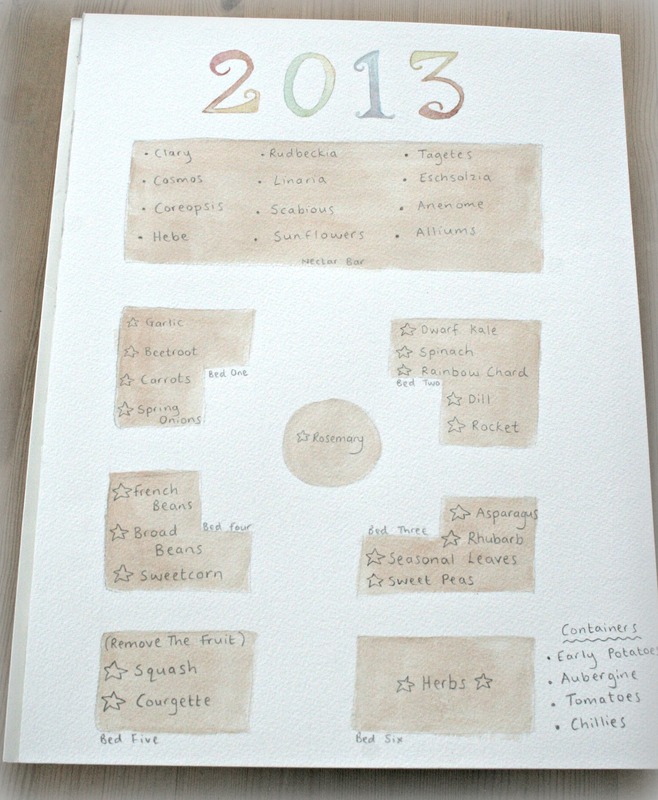 I don’t suppose my plan will be followed as I get far too carried away but it is good to pretend that I’m organised! Thats a lovely view from your thinking place. 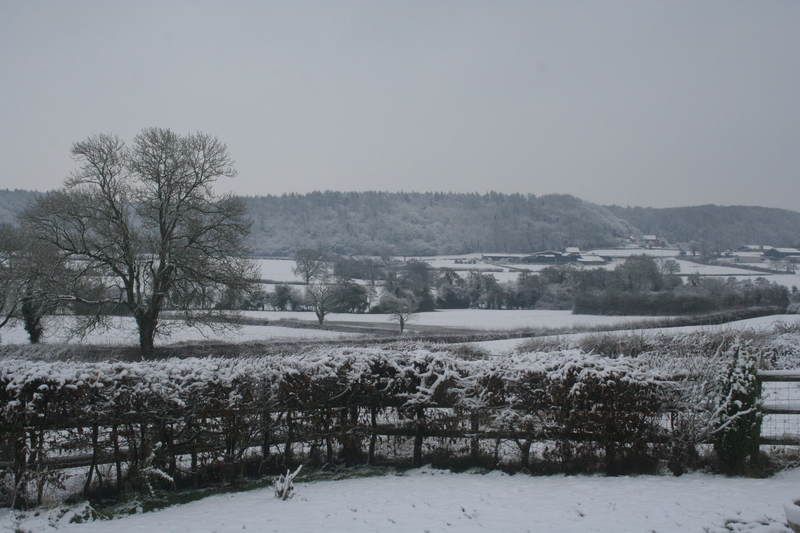 I guess I do a lot of my thinking and planning for the garden in my back bedroom, where the view from the desk is over some allotments and to Castle Hill. But more often its when I’m in the garden or at the allotment. 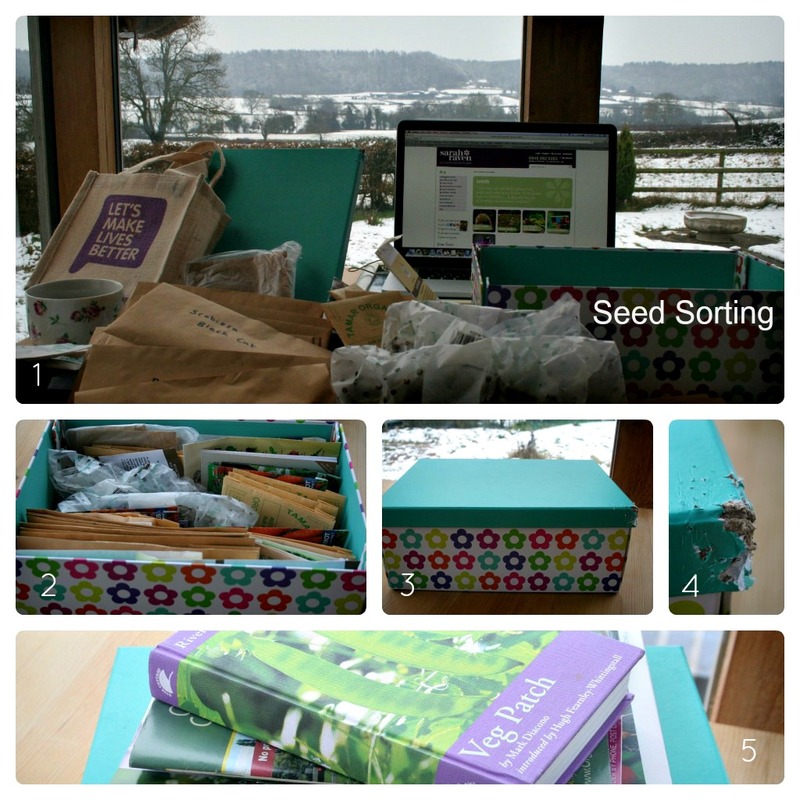 My seed boxes are overflowing now, I think I need another sort out like yours, think I’ll have to before I start sowing in earnest. I cannot get over your view! Incredible! I’m about to gush…so you’ve been warned. I love everything about this post. Your super-cool, and organized drawing, that comfortable chair, your view, the seed box and those cute as a button felines. They’ve really grown! I do my best thinking outside or looking outside. It’s a place to rest your eyes and to go deeper then you might have otherwise. After seeing your beautifully organized garden plan and seed box, I think I must get to work and put my own plans in order. Presently, my seed collection is roughly grouped and held together with a crude elastic band! I am not sure I have a thinking place. Perhaps at my art table, which is in the 3rd floor attic, and has a view on the outside world. I feel happy and content when I sit there. Ooo, that chaise looks so comfortable. And the view is spectacular. Let’s see, my thinking place… during warmer months, it’s on our cheapo plastic Adirondack chairs in the backyard with the chickens. In the winter, I guess it’s our front reading room – no computers allowed up there, and the only room with south facing windows. I LOVE LOVE LOVE your little garden sketch!! what a nice keepsake! You are well ahead of me with your planning!